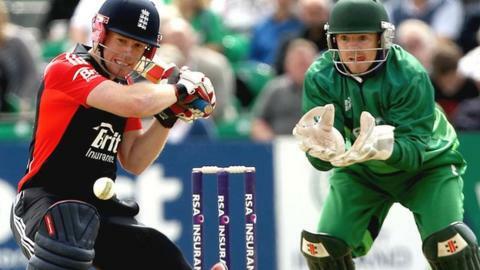 Ireland will take on England in a one-day international at the revamped Malahide ground in September next year. The venue near Dublin has undergone major renovations over the past three years and now has a 11,500 capacity. The game is expected to attract the biggest ever crowd at a cricket international in Ireland. Ireland clinched a shock win over England at the World Cup in March last year but lost when the sides met at Clontarf five months later. Dublin-born Eoin Morgan, who played 63 times for Ireland, captained England in their 11-run victory. England have won four of the five ODIs between the teams but the last three encounters have all been nail-biters, and Ireland coach Phil Simmons is already looking forward to the showdown on 3 September, 2013. "I live just around the corner from the ground so it's fantastic for the club and the area to be hosting a game of this magnitude," said Simmons. "It's going to be a super venue for cricket, and the fact that it's England coming will give the whole day that extra edge that contests between the countries in all sports seem to inspire." Malahide will also host two Twenty20 games against a touring South Africa A side this year, on 31 August and 2 September.